Planning to head out on the road and write the next great American novel? Or maybe you travel on a budget, or work from your vehicle, or you just love your car so much you want to live in it. 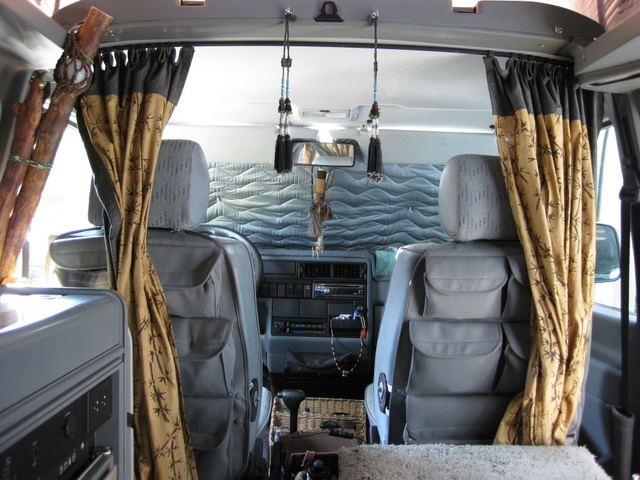 Whatever your motives, hanging curtains in your vehicle will make it a more inviting, livable space. Our friends, David and Deborah, know just what we are talking about. They do a lot of travelling with their cat, Flea, in their 1995 EuroVan Camper, and have documented the extensive renovation of this vehicle on their blog. 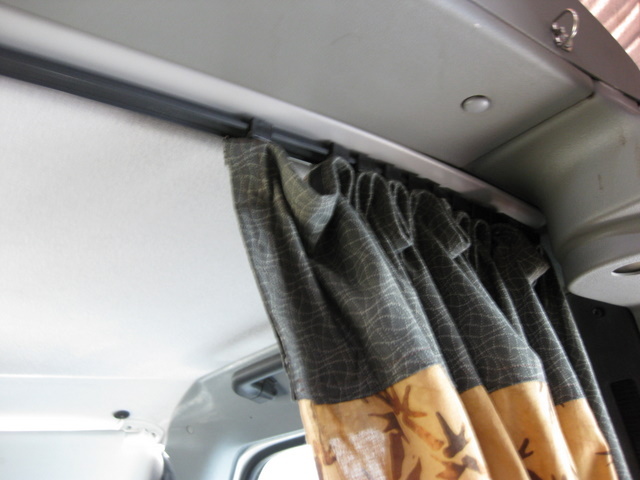 We were happy to supply curtain tracks and drapery hardware that allowed them to separate the back part of the van from the cab, and create some privacy for sleeping. We love the decorative curtains they used and applaud their economic use of space. Whether you are travelling for business or pleasure, whether you drive a car or a big rig, this approach can work for your vehicle, too. David and Deborah used 3112 Plastic Curtain Track, with snap carriers and snap tape which is a great system for this application. The track is easy to install and the snap carriers and tape allow the curtain to keep a rippled shape, which works well in a small space. The curtains can also be removed easily for cleaning or a new look. If the space you want to cover requires a curve or bend in the track, the 4108 Bendable I Beam can be hand bent to a minimum 2 inch radius and can be used with the 3082 Snap In Retainer Catch. Retainer Catches are extremely popular for vehicle applications and are also safer. The 3080 Retainer Catch is also available and is compatible with the 3292 Track.